If you do not own a lot of Lego Technic® bricks (GBC modules are mainly made of which), it can be quite a challenge to start building your own modules without restricting your imagination and ideas. Being in that situation at the start, I’ve turned myself first to digital design. My first advice is therefore that you start by downloading and installing Lego Digital Designer, aka “LDD”. 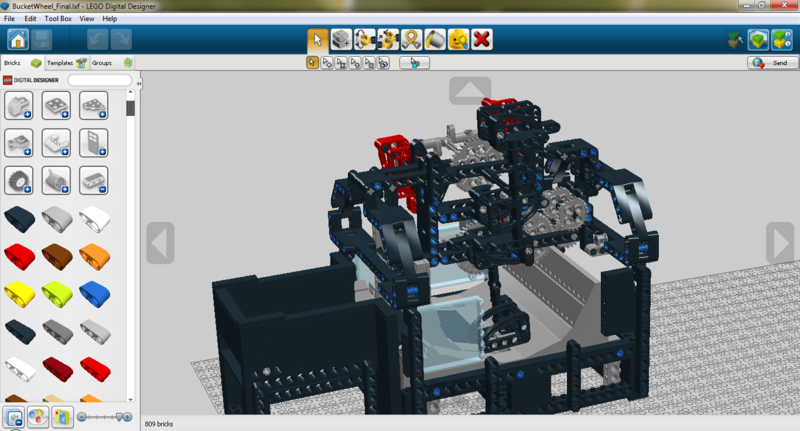 LDD is a great FREE Lego 3D designing tool. It is made available by Lego Group itself, and comes along with an exhaustive catalogue of bricks, allowing you to sketch Lego creations, from the easiest ones to the most complex ones. The beauty of the tool is that you can generate step-by-step building instructions, a bit like the ones you get when purchasing a standard Lego set. An easy way to go from digital to reality. You might feel a bit of panic at this stage in case you do not consider yourself as an IT geek. Don’t worry, modeling modules over a digital tool is not mandatory at all to build a GBC module. You can limit yourself to the installation of the tool, download some building instructions from Planet GBC that you’ll open with LDD and simply follow the building instructions to construct your module. If you feel a bit more adventurous or if you are simply more familiar with computers, LDD is really worth a try. Get familiar with LDD building Interface, spend a couple of hours following some tutorials and experimenting the tool. You won’t regret it. LDD tool comes along with some – sometimes very frustrating – limitations (sometimes, it’s a bit hard to assembly some parts in special angles or to rotate some parts). However, the features proposed by LDD remain quite good and it’s worth the time investment. If you are ready to follow my advice on digital design but feel a bit frustrated by LDD limitations, and if you do have a more solid 3D modelling background, you can also download LDraw tool. LDraw is an unofficial 3D Lego designing tool, supported by an active community. LDraw aim is to offer a software that bypass some of the limitations of LDD, providing for instance more readable building instructions or allowing a more accurate orientation of parts. The tool also allows you to combine several files into one single bundle called “Multi-Part Documents”, also known as MPD files. LDraw will then be able to read simple file, having .ldr extension, as well as container file having .mpd extension.